UKULELE WIZ: Taimane Gardner, above, acknowledges the applause of the crowd after performing a song on her custom 8-string tenor ukulele. Taimane, 16, has played for six years at the corner of Kalakaua and Liliuokalani avenues, often accompanied by her younger sister, Teuila. Lawmakers look to ease the burden of property ownership by cutting taxes. The Japanese visitor was under water for more than 10 minutes, trapped in a parachute. 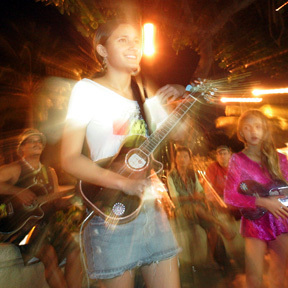 Ukulele wiz Taimane Gardner -- her name means "diamond" -- has been shining on Kalakaua Avenue since she was 10 years old. Milton Drageset recently traveled to Panama City where he saw a small restaurant named "Waikiki Aloha." Campbell is 2 strokes back and Furyk is another shot behind at windy Kapalua. A company founded to create custom furniture and decor for Pacific resorts offers its services to individual homeowners. Hawaii's natural resources are threatened by lack of enforcement officers and leadership, according to an audit.